At the beginning of our observance of the Jewish Sabbath last Friday night, we said the customary opening prayers over the Shabbat candles, wine and bread. I then had the impulse to add one more prayer called the “Shehecheyanu,” which is a special thanks for surviving to that day. It is also tradition to say it when doing something for the first time that year. My wife asked me why I had taken this moment to say it. I said, “Risa, it’s opening day of the baseball season on Sunday. I get to celebrate it again.” And she knew I really meant it. I know I’m hopelessly sentimental about this stuff, but baseball is a secular religious experience for me. It signals another chance to win, another hopeless challenge against impossible odds as a Chicago Cubs fan. But who knows? Last year the Pirates made the playoffs and Boston went from last in 2012 to winning the World Series behind a Japanese reliever who barely made the roster and David Ortiz who batted .600 in the playoffs after everybody thought he was washed up before the season. Miracles can happen. Kansas City could win it all this year, maybe the Twins. God knows. Do I know my team, the Cubs, stink? Of course, but it’s April, I still have hope. One of the things I love about baseball is the language and literature of the game. No other sport has anywhere near the library of books, essays, plays and movies as baseball. I grew up reading THE BABE RUTH STORY, then THE LOU GHERIG story. I was no bookworm as a kid, but those books captivated me. I graduated to Bernard Malamud’s The Natural later, but honestly the movie is better than the book. 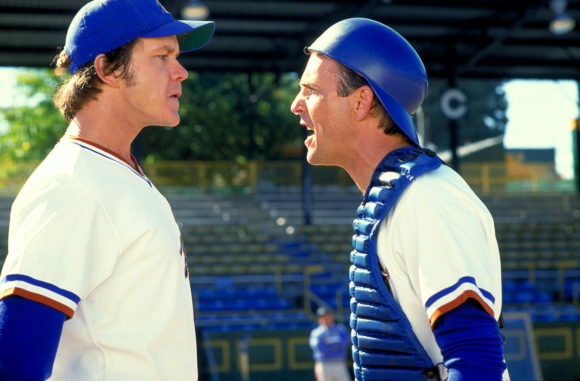 My favorite movie is Bull Durham, though I loved it more the sixth time I watched it than the first. My runner up flick is the less acclaimed but equally wonderful For the Love of the Game, also starring Kevin Costner. I also strongly recommend book (and film), Moneyball, by Michael Lewis, which is great, but not even his best baseball book. Lewis’ story about his high school baseball mentor, Coach: Lessons on the Game of Life, published in 2005, is his best piece of work. It seems like something really cool comes out every year. Last year 42 came out, the story of the great Jackie Robinson breaking the color barrier. I rate Robinson one of the most important figures of post war America. The movie is no classic, but worth seeing. The long article in Sunday’s New York Times on Masahiro Tanaka, the Yankees’ huge signing of the off-season, is a worthy read for anybody who likes baseball or is intrigued by Japanese culture. Reporter Barry Bearak went to Itami, Japan, near Osaka, to really get into the life of Tanaka, who signed a $154 million contract after going 24-0 last season in the Japanese Major League. He was a catcher growing up who was considered a prodigy by 5th grade. In Japan, youngsters are recruited for baseball like LeBrons. The Japanese national high school baseball championship is the equivalent of our NCAA Basketball Tournament in prestige and national following. Tanaka could have gone to high school anywhere in the country, but chose to go to Hokkaido to learn the game–a place so cold he literally took grounders on ice and routinely hit in the snow. Tanaka ultimately turned to pitching at the urging of his high school coach, but credits growing up as a catcher for some of his success. He decided to come to America for the huge money (three times more than he could get in Japan), the competitive challenge, and to follow his model, Yu Darvish, who signed three years ago with the Texas Rangers. Darvish is A favorite to win the Cy Young award this season. Baseball is back. The planet has cycled. More is right with my world. Question: Should college athletes be paid? I believe they should be paid to play, as well as insured for any future medical issuse that come from injuries they sustain while playing. Sure, all the benefits of league play, including taxes on income/scholarships, after all in many cases the tax payers funded them, why shouldn’t the public treasury benefit as well. Play ball Lloyd… but don’t pull a hammy! While the Cubs may be lousy, they’re not hated by anyone… which is a blessing of it’s own. Sure pay the athletes. Then non-athletes scholarship winners should get paid. And when will it stop? Do eventually all students get paid? Ask yourselves who will actually be paying them? The schools or the tax payers? Who then is paying the unions the schools or tax payers? Then does the unions unionize all the students? Sounds like another government sponsored cottage industry for special interest groups. What will happen to the private schools who do not have a tax base to collect against? Most important question is what good will this do for the country? the scholarship in no longer free, they have to pay for the schooling. Loved the column and the Bull Durham video. Now, I’m waiting for the musical to open. Noah suggested the Bull Durham clichés clip which I think is one of the best movie scenes ever. I think Kevin Costner is an absolutely fabulous actor. I think he is is in the new movie coming out about the NFL draft, Draft Day. Perhaps his best role was in Tin Cup especially the the scene where he can win the PGA with a lay up on the 18th but is compelled to go for the impossible shot on the green. He uses all of his allotted balls up, but hits the last one on. In order to consider payment I think we need to define what “work” is being accomplished. Is a student athlete performing “work” for the university in the same sense that the professor, grounds keeper or office manager is? How about the engineering student “working” on the Baja car competition. Designing, fabricating, testing and competing. Sounds like the stuff that professionals get paid for. But I do not consider it work on behalf of the university. It is part of the education. Let ’em play. But don’t confuse it with work. Careful John when you start defining “work” at a university! I have several friends who are professors. They “work” about 20 hours a week during the school year, then are off for the summer. They are all making six figures with big pensions. The education industry is not living in reality. Someday people will wake up to the fact that they are overpaying for a piece of paper and supporting a whole group of people who are insulated from the real world. The piece of paper gets you in the door. Hard work and continual learning keeps you in the door. If a young athlete wants to earn money via a sports career please skip the higher education and jump right into the professional sports. College is expensive enough, taxpayers do not need to ‘pay for play’ for these ‘students’. These players can always attend college later in their life after they are done playing with balls. More importantly they can pay their own way with the earnings from the sports career. Considering statistically very few college athletes make it to the professional sports arena why add any more incentive to people who don’t realize the true reason for attend college. I find it foolish that some of the highest paid faculty are the coaches and NOT the staff attempting to educate our future leaders. March madness is a perfect example of college coaches ( Calhoun and Auriemma) making millions because they get their teams to the final four year after year. Public records show UCONN women’s coach Eugene Auriemma signed a new five-year contract which will keep him through the 2017-18 season. He will be paid $10.8 million over the duration of the contract. X2 what JOL wrote. If you want to get paid go pro. From a revenue and exposure point of view Auriemma is considerably UNDERPAID.